Can Jews be tattooed? Can Jews be tattooed? I’ve written on the subject of religious objections to tattoos before (if you’re interested, you can read that entry here). I was reminded of that by a story in yesterday’s local paper, on the subject of Jews and tattoos. Before I begin today’s essay: I had one Jewish grandfather, but he died before I was born, and I don’t claim any expertise on the subject of Judaism or the Law and the Prophets. I am an interested outsider, with a nearly lifelong interest in Biblical history and comparative religions. I belong to no sect, either by heritage or by choice. All human theological traditions both living and past have an equal chance of being true, in my opinion. That said, it is widely believed that there is a prohibition against making any marks on the body in the book of Leviticus. The various translations seem to agree that people should not cut themselves “for the dead” (it was a tradition in many cultures for the bereaved to slash their own skins). But what follows differs depending on which translation one reads. 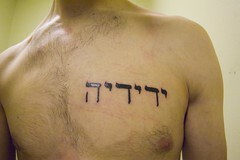 Some prohibit “making marks” or “printing marks” on the skin, while some use the word “tattoo.” I can’t read Hebrew, so I don’t know exactly what the original Scripture said. I am looking forward to Dr. James Tabor’s group’s future publication of The Transparent English Bible, so those of us who can’t read the original IN the original can finally get as close as possible to what it says. Many Jewish people believe that the prohibition is against tattooing, which made the death-camp marks all the more horrible. And that memory quite rightly lingers on, lending greater force to the present-day prohibition on tattoos. Whether a modern tattoo becomes a matter of honor or horror is far beyond any outsider’s business to decide. But according to the article, many modern Jews are choosing to be tattooed precisely because they value their heritage and wish to say so in a permanent way. Does 21st century choice enter into it? In an earlier post, I talked about choosing religious or spiritual designs for tattoos. I believe those designs should have intense personal significance, and certainly people who choose to override religious prohibitions must have strong feelings on the subject. Here is a link to the original story. If you do a Google search with “Jew tattoo” you’ll find plenty of opinions pro and con, with good reasons to support both sides. Do you have an opinion? I’d like to hear it.